For the pastry, whizz together the flour, almonds, butter and a pinch of salt in a food processor until the mixture resembles fine breadcrumbs. Add the sugar and egg yolks, then whizz until the pastry comes together into a ball. (If you don’t have a food processor, rub together the flour, almonds, sugar and butter with your fingers in a bowl, then stir in the egg yolks with a wooden spoon.) Shape the dough into a flat disc, wrap in cling film and chill for 40 minutes. Put all the filling ingredients and 50ml water in a large pan. Bring to a gentle simmer and cook over a low heat for 15 minutes or until the rhubarb is tender. Remove from the heat, strain away the excess rhubarb juice and leave to cool (see tips). Roll out two thirds of the pastry to a roughly 30cm circle (you may need to dust the work surface with a little flour to prevent the pastry from sticking). Carefully roll the pastry around the dusted rolling pin and unroll into a 23cm pie dish or tart tin. Use a piece of pastry to push the pastry case into the edges of the tin, then trim away any excess. Use the trimmings to patch any gaps (see tips). Chill for 20 minutes in the fridge (or for 10 in the freezer). Heat the oven to 200°C/180°C fan/gas 6. Line the pastry case with a large piece of baking paper/foil and fill with baking beans/rice. Bake in the oven for 15 minutes, then remove the beans/rice and paper/foil and cook for a further 5 minutes or until the pastry feels sandy. Remove from the oven and leave to cool slightly. Spoon the rhubarb into the tart case, then roll out the rest of the pastry into a 14cm x 24cm rectangle the thickness of a £1 coin. Slicethe pastry into 14 x 1cm wide strips. 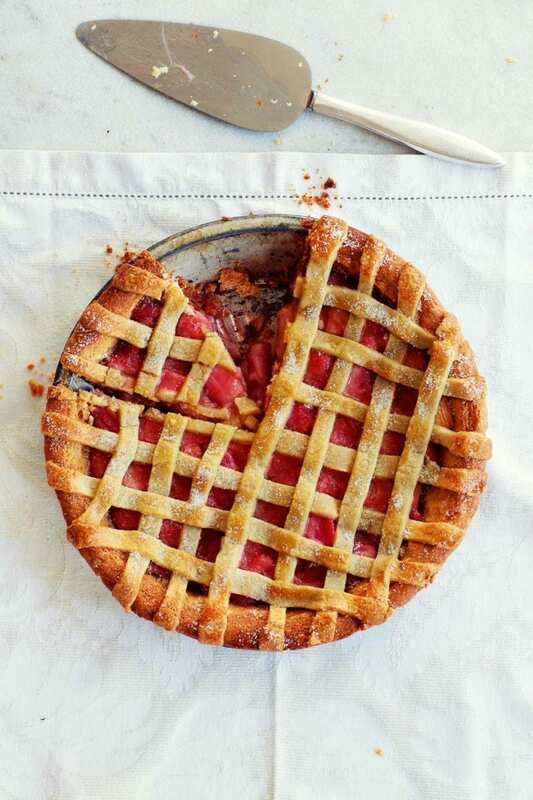 Lay one strip on top of the pie, a couple of centimeters from the edge of the dish, then trim the ends, pressing them down gently onto the pastry rim to secure. Repeat butat 90 degrees. Continue laying on pastry strips, alternating the direction, leaving a 2cm gap between them to create a lattice of overlapping strips. Sprinkle the tart with caster sugar, then bake for 15-20 minutes until the pastry is golden on top and the filling is warmed through. Leave to cool slightly, then serve with ice cream, cream or custard. Save the excess juice from the rhubarb and mix it into other fruit juices or add to sparkling wine to make rhubarb fizz. Almond pastry can be a bit fiddly to work with. If it cracks as you’re lining the tin, just patch it up as best you can with any offcuts. No one will notice when the pie is finished. Make the pastry up to 2 days before using, wrap in cling film and keep in the fridge. Alternatively freeze it well wrapped for up to 1 month. Stew the rhubarb up to 24 hours before using, then strain and keep covered in the fridge.